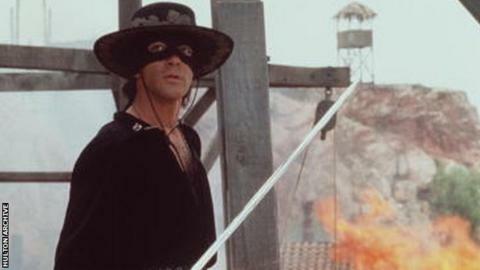 Spanish actor Antonio Banderas portrayed Zorro in the 1998 film"The Mask of Zorro"
Chelsea manager Guus Hiddink says he has a "team of Zorros" after striker Diego Costa broke his nose in training. Costa will be the fourth Chelsea player this season, after Gary Cahill, Cesar Azpilicueta and Nemanja Matic, to wear a mask like that of the fictional hero. The Spain striker was injured during training but is expected to feature in Saturday's home game with Newcastle. "He will return, he will have a mask on. We are a team of a lot of masks - we're a Zorro team," Hiddink observed. Costa was injured in a collision with an academy player going for a header. "Diego put his nose on the back of the player and was very unlucky," Hiddink added.